The NCMJ is a journal of health policy analysis and debate copublished by the North Carolina Institute of Medicine and The Duke Endowment. 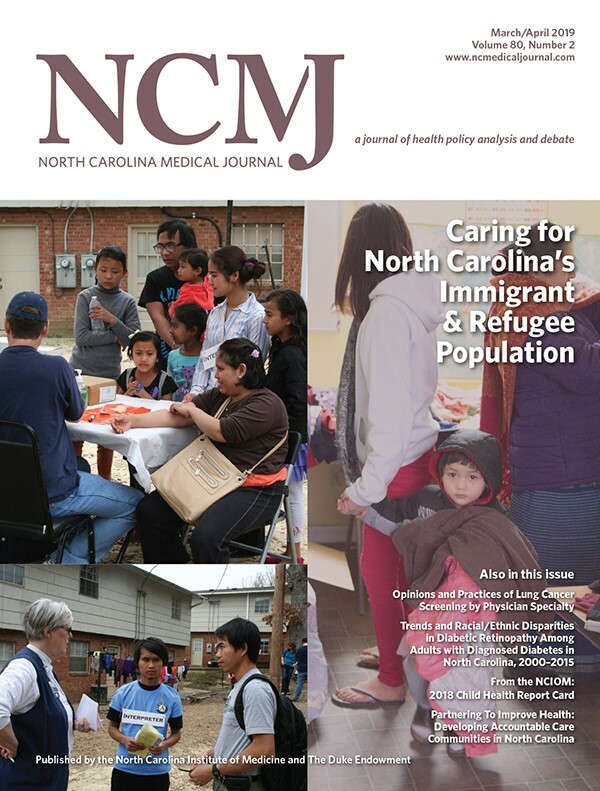 This issue of the NCMJ covers the many challenges and opportunities associated with caring for North Carolina’s growing immigrant and refugee populations. 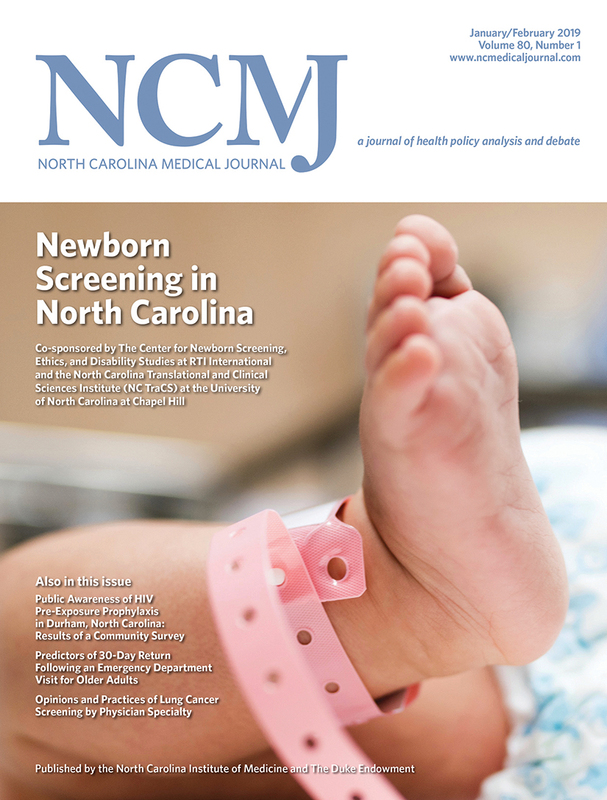 This issue of the NCMJ celebrates North Carolina’s pioneering influence on the field of newborn screening, which identifies potentially life-threatening conditions in babies before symptoms occur. 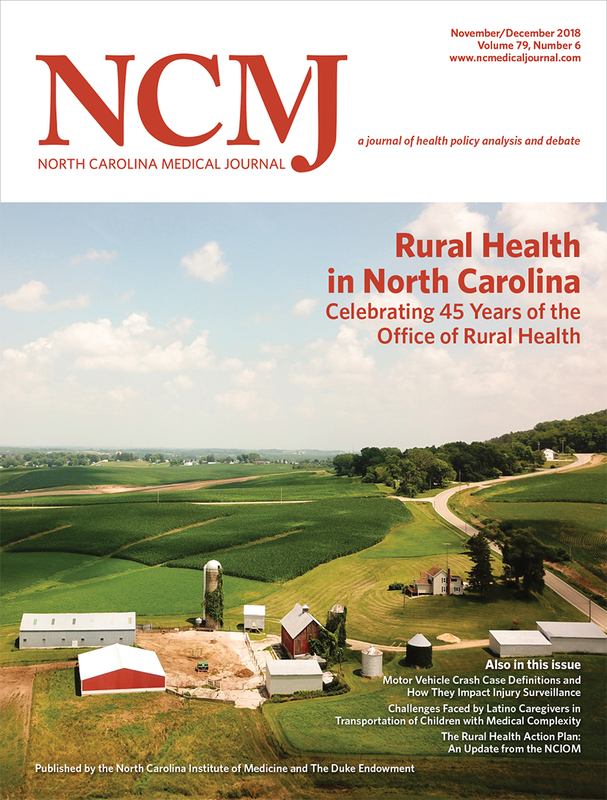 This issue of the NCMJ focuses on the health care challenges and opportunities facing rural North Carolina. This issue takes a look at the myriad ways the environment affects the health of North Carolinians. This issue of the NCMJ examines the role of teams in North Carolina’s health care ecosystem. It takes a look at what really makes a good health care team, whether North Carolina’s workforce is prepared for team-based care, alternative financing models for this type of care, the roles of the patient and of technology as part of the team, and more. This issue of the NCMJ addresses the sources, consequences, and potential solutions for the opioid crisis in North Carolina. Authors tackle the problem from a variety of perspectives, including public health, private practice, harm reduction, behavioral health, criminal justice, local government, and law enforcement. This issue of the NCMJ examines the effects of adverse childhood experiences (ACEs) on lifelong health. Public health providers, social workers, and researchers share data on the impact of ACEs, details about related issues such as poverty and domestic violence, and recommendations for promoting resiliency. In addition to laying out the problem of childhood trauma, this issue provides examples of success stories from around the state, as well as prescriptions for how communities can combat ACEs in the future. This issue of the NCMJ explores the high cost of care in North Carolina. By incorporating several viewpoints, including that of providers, consumers, insurance, and pharma, this issue provides a broad overview of the various drivers of high health care costs. This issue also discusses managing the cost of care through addressing social determinants of health, tobacco use, and an aging population. This issue of the NCMJ explores approaches from North Carolina and around the nation in addressing oral health problems. This issue of the NCMJ examines a range of musculoskeletal health issues, strategies for improving management of such conditions, and gaps in care. This issue of the NCMJ explores the opportunities of accountable care communities in North Carolina and highlights initiatives across the state that are already engaging in this collaborative work. This issue of the NCMJ discusses the ways in which the role of the pharmacist in health care in North Carolina has expanded.